Volumetric efficiency is the ratio between the quantity of fuel that can enter the combustion chamber and the displacement of the engine. One of the main factors affecting volumetric efficiency is loss due to friction that the fluid encounters (air-fuel mix) when feeding from the air filter to the combustion chamber. Therefore, one of the components that greatly influences this loss is the intake manifold, since all of the mix has to travel through it with the minimum possible loss . For this reason, sudden increases in section and corners along the mix path must absolutely be avoided. 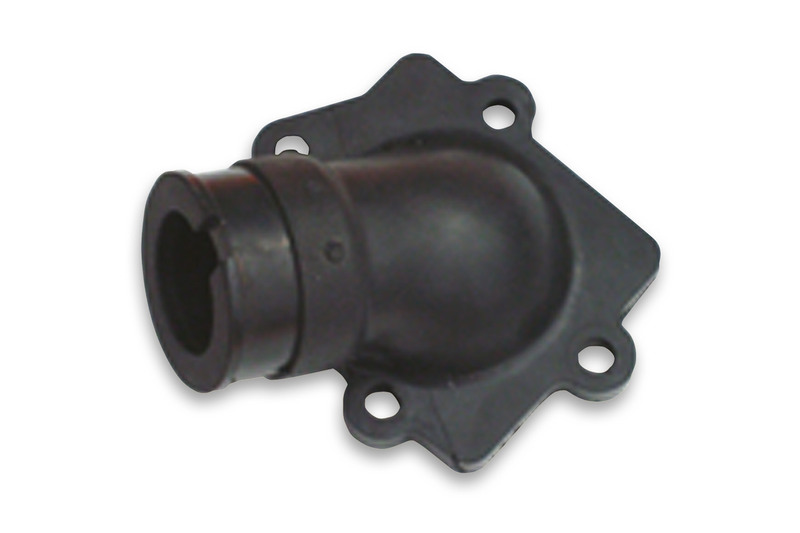 The intake manifold also acts as an accumulation tank for the fresh load , since the mix, travelling at a certain speed, requires time to stop when the reed valve closes. Therefore, mix collects in the manifold and exerts pressure against the reeds. For this reason, each manifold has a well-defined range of revolutions within which it provided maximum efficiency (tuned manifold). In addition, the manifold supports the carburettor by connecting it to the engine casing or to the cylinder , damping vibrations between casing and carburettor and preventing emulsion of gas and air in the carburettor tank. This apparently simple component therefore requires a great deal of study in order to take full advantage of all of its qualities. Malossi engineers have achieved this to perfection. Malossi, with decades of experience in engine fuelling systems, has created a new line of manifolds in rubber and aluminium alloy for the new generation of scooters, and has tested and developed the line on roads and race tracks. Malossi rubber manifolds feature a composite structure. Their construction begins with an aluminium insert that is encased in a special plastic material that is impervious to oils and fuels, guaranteeing increased rigidity at the point of attachment to the casing and greater flexibility of the manifold body.